Cryptic Studios puts Champions Online's nemesis feature to good use next week, pitting players against their self-created arch nemesis in a battle to save the universe from inter-dimensional evil in the Nemesis Confrontation event. Allowing players to create their own nemesis in Champions Online seemed like a great idea, but I always wondered what Cryptic would do with them once they were created. Now we know. Starting November 24th, the Nemesis Confrontation event will let players team up with friends to take on their nemeses together. 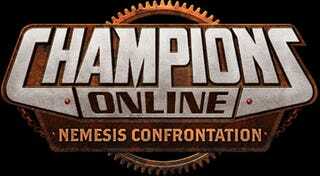 "We wanted to take our unique Nemesis System to the next level and do something really awesome with it," said Bill Roper, Executive Producer of Champions Online. "So we asked ourselves, what if your Nemesis could band together with your buddy's Nemesis to take you on? Epic." Players will have to band together against a team of their greatest foes in order to stop them from tearing a hole in reality in a bid to take over the Champions universe. The event will feature a brand new location and new, intergalactic gladiator enemies to the mix as well. Sounds like a good time! And in case you've let your Champions Online subscription lapse already, Cryptic is holding a free weekend the 26th through the 28th, just in case you wanted to return to give your nemesis the beat-down. Visit the event page for more information on Nemesis Confrontation.